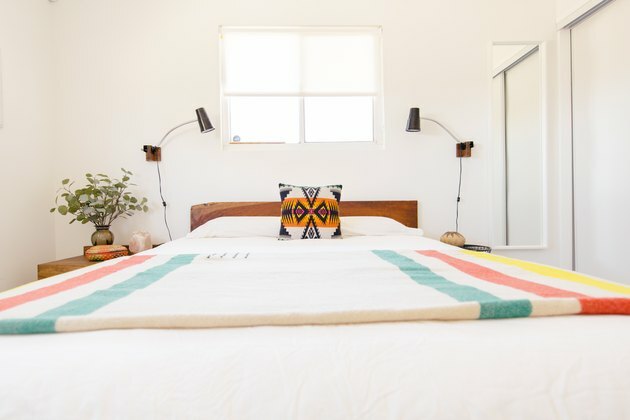 The Homes of a Musically Inclined Couple That Splits Their Time Between Joshua Tree and L.A. 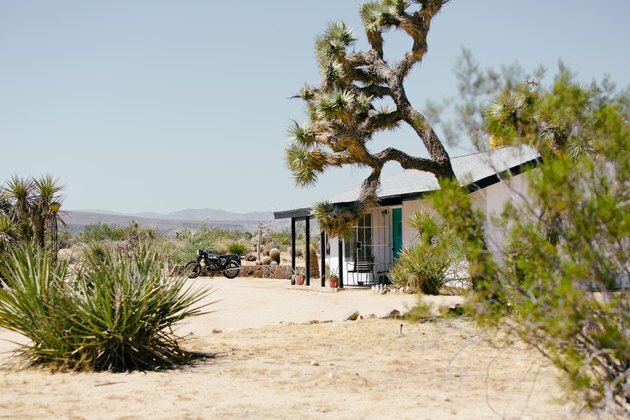 When Chris and Anna Pearson aren't working their day jobs in Los Angeles, they're escaping to their newly-purchased Joshua Tree haven. 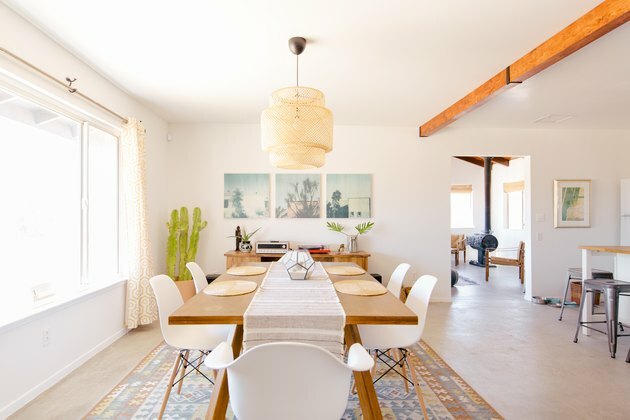 Chris owns Echo Ranch, a boutique interior design and home staging company, and his talents can be seen throughout both their home base in L.A.'s Highland Park neighborhood as well as their in new Joshua Tree home, which they rent out as an Airbnb, too. 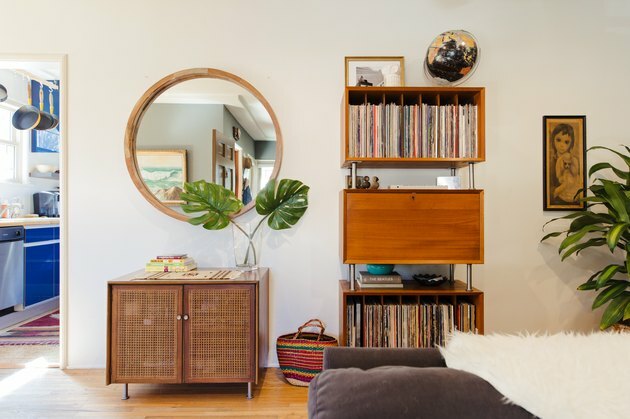 A consistent factor throughout both of their homes is Chris and Anna's joint love for music. Anna works in music management, and Chris has a passion for guitars, which can easily be gathered just by taking a peek into their spaces. "We have many shared passions including our dogs Polly and Charlie, music and live concerts, traveling, and escaping to the desert," Chris said. Highland Park, where Chris and Anna spend most of their time, is a historic neighborhood in Los Angeles. Their three-bedroom California bungalow home has a gray exterior accented by a pop of red on their door, which is covered in a bubble pattern. Their living room is decorated with midcentury-style pieces. 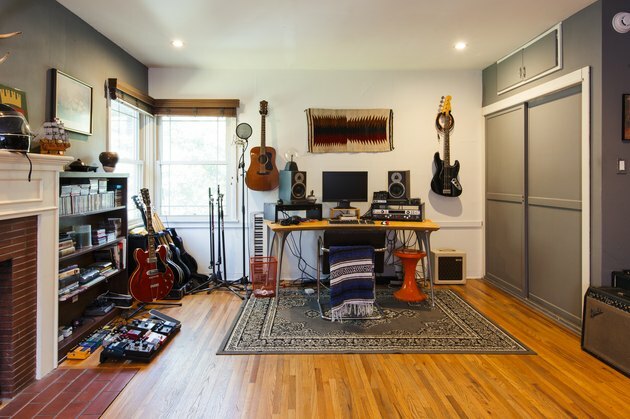 There are instruments galore in Chris and Anna's home studio setup. 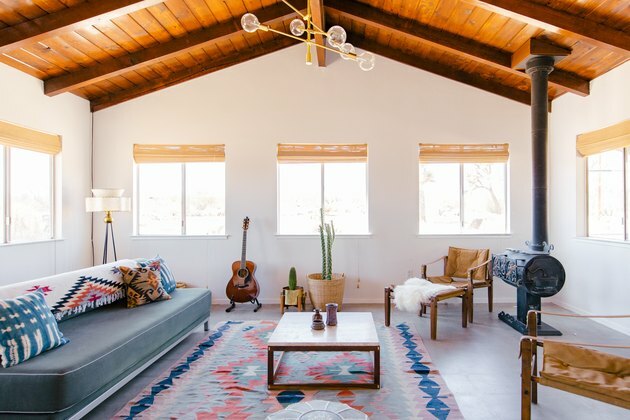 Chris and Anna have friends living in Joshua Tree, and visits with them are what eventually inspired them to purchase a place of their own last February. "It's secluded enough to have that middle of nowhere, desert escape feel, but still central to everything we love to do out here," Chris said. "The property has so many Joshua trees, old cacti, and large desert cedar trees. It really is like an oasis in the Mojave." 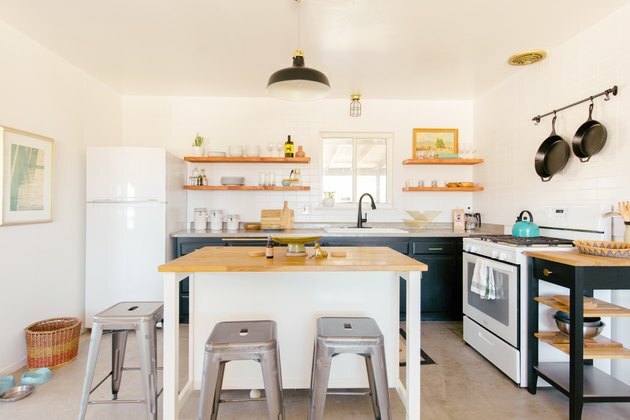 The style of the two-bedroom Airbnb is minimal, and it's mostly furnished with pieces from Chris' staging business as well as pieces he had been saving in hopes of one day owning a cabin. The artwork in the dining room was commissioned by one of their favorite artists, Ryan Snow. The largest remodel occurred in the kitchen. Chris and Anna took out the upper cabinets, and replaced them with floating shelves. They also tiled the walls to the ceiling. Throughout the home, Chris and Anna removed all the old flooring to reveal the cement foundation, which they had polished up. Chris made the walnut bed frame in the master bedroom himself. It takes inspiration from George Naskashima and Case Study beds. 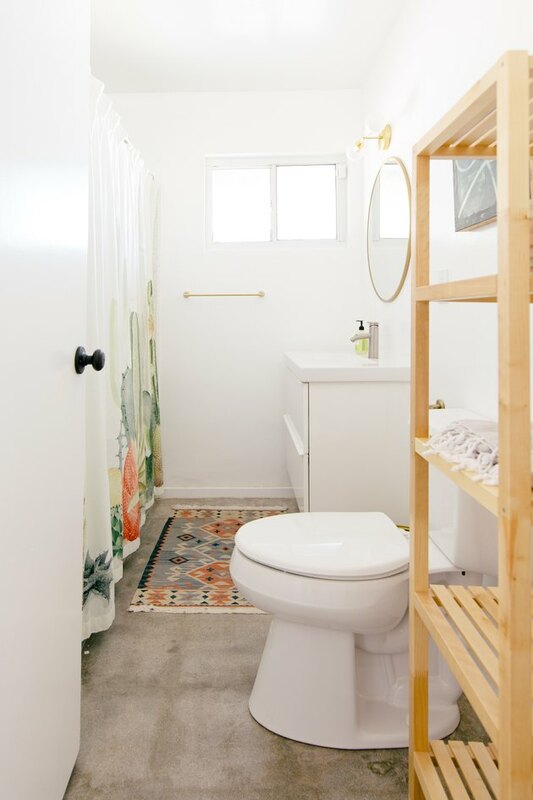 The light and bright bathroom is garnished with a colorful shower curtain and rug. 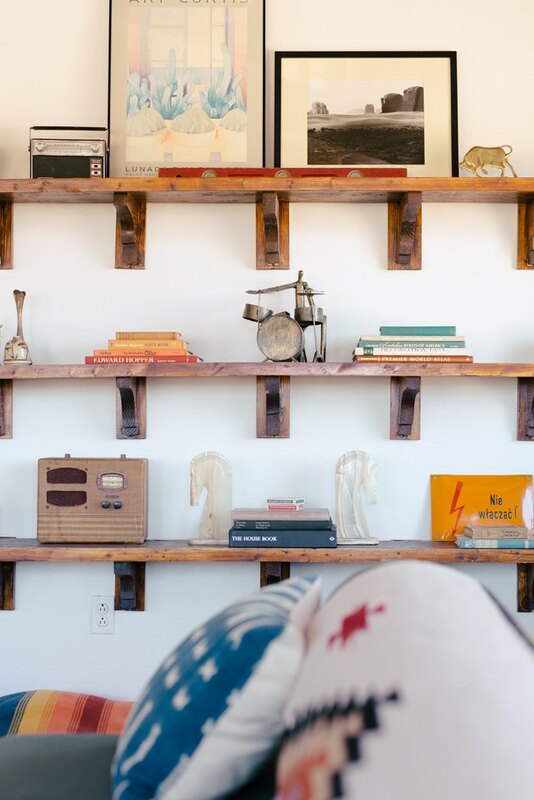 The previous owner of the home built these custom bookshelves in the living room, which Chris and Anna gladly kept and decked out. This is Chris' favorite room of the home because of its open beamed ceiling, wood burning stove, and view of the Joshua trees toward Pipes Canyon and Big Bear. "[The Airbnb] isn't currently our primary residence, but we really wish it could be," Chris said.